These toys are based on designs appearing in a new Mazinger Z Manga, called Mazinger Angels. 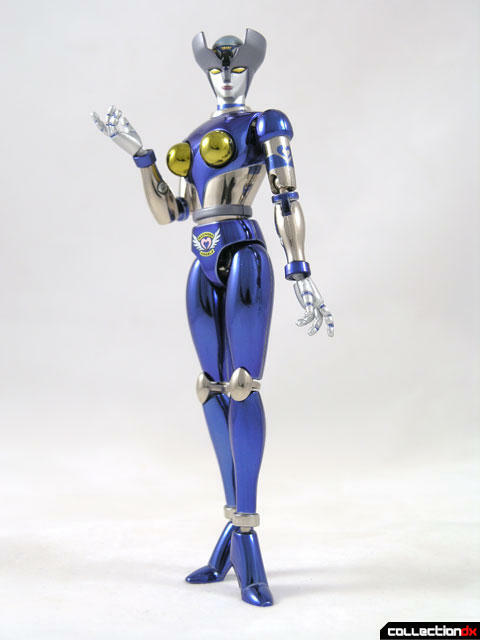 They are re-styled versions of the original female robots from Mazinger Z. The Angels first appeared in 2004, and as of 2006 they are still releasing versions. 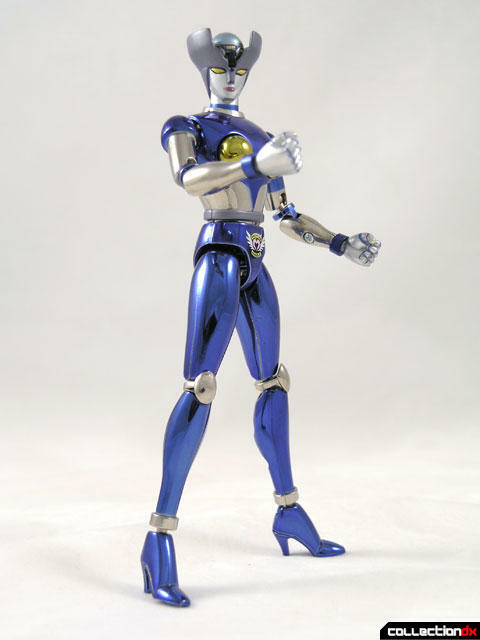 Dianan A was one of the less interesting Mazinger ladies when they were first released, is only marginally better as part of the Mazinger Angels line. Granted, the toy looks good, but aesthetically, its too far removed from what I like in a toy. It's essentially the same as the original, minus the chrome paint job and alternate accessories. The Screw Crusher Missiles appear to be a nod to Grendizer's "Screw Crusher Punch" attack, with the blades looking just like Grendy's. They, along with all the Oppai missiles, can fire by pressing a button on the figures back. The liquid shooters can be held in either hand but don't actually shoot anything. Lastly, the scarlet Mobile attaches to Dianan A's head. The sword is kind of cool, but it is not made of metal. 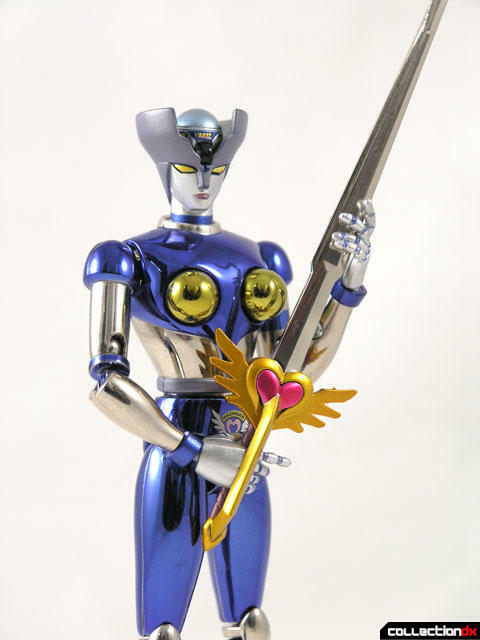 Dianan A can hold the sword in either hand, and the stand has a place for it when not in use. 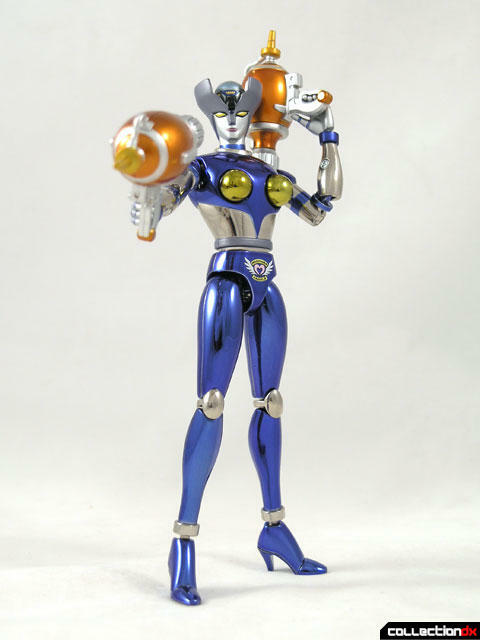 The stand is basically the same stand as the previous Mazinger Ladies. Bandai remains inconsistent with their use of either labels or nameplates, this time opting for labels. The Hong Kong version of this toy came with a special premium, a metal compact. It's a clamshell case with a mirror for doing makeup. The Mazinger Angel logo is on the outside, while Dianan A's head is embossed inside. This figure didn't do much for me. Don't misunderstand me, it is a quality toy, and I see how a lot of people would totally dig its updated looks, but the style of these angels just isn't for me. I prefer their old-school original incarnations. If you like this restyling, you won't be dissapointed.